Home » Reviews and Publicity » Stars for YEAR ONE! This is Nora Roberts like you’ve never seen her before: as a fantasy writer! 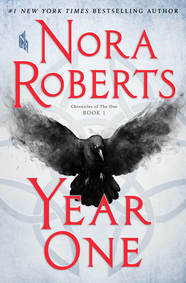 YEAR ONE: Chronicles of the One is the stunning beginning to an epic hardcover trilogy from the #1 New York Times bestseller. In this enthralling saga of suspense and survival, a sickness has wiped out more than half of the world’s population. And as the power of science and technology receded, magic rose up in its place—some of it good, like the kind Lana Bingham and her lover, Max, practice; and some of it unimaginably evil. As New York City becomes unsafe for them, Lana and Max head west on a journey that will unite a desperate group of people to fight the battle of their lives. A December 2017 Indie Next pick! YEAR ONE has two starred reviews! YEAR ONE will be available from St. Martin’s Press on December 5, 2017.